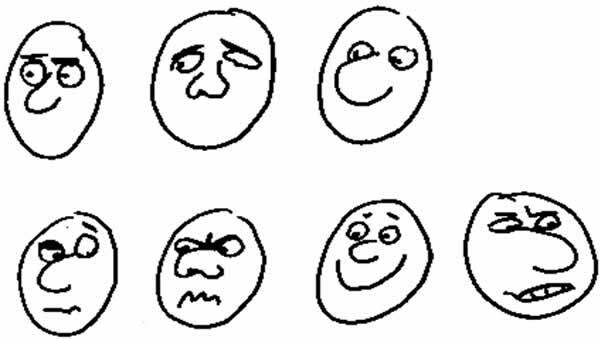 Eyes are the most expressive part of a cartoon face, so these too need lots of practice. But simple expressions are not difficult to create. First draw lots of pairs of circles and oblongs as below, add dots, don’t make the dots too small. Then add eyebrows. Do plenty of variations. You’ll find that larger dots seem to convey a ‘soft’ expression, smaller ones a ‘harder’ expression. Next , draw nice free ovals and add the eyes. Experiment with all sorts of variations of your own. This helps create your own ‘style’. Create simple noses and mouths and add them. Do different combinations, and you’ll find you’ve created a variety of personalities.